We are pleased to announce that Ed Rawls Jr has accepted the caretaker position. Ed is a Bertie County native. He attended Lawrence Academy and graduated from East Carolina University where he earned a Bachelor of Science degree in Design with a double concentration in business administration and urban and regional planning. Currently he resides in Windsor and farms with his family. He has a good eye for the way the grounds should look, a very good presence, and is a skilled decorator. We look forward to working with him. Welcome Ed !!!! Bobby Williams, our caretaker and site administrator for the past seven years retired in early February. Bobby came to Hope in 2012 having worked as a Production Manager of United Piece Dye Works in Edenton and as manager of the wastewater treatment plantation for the City of Edenton. We quickly learned that Bobby could do almost do anything. In addition to his routine caretaker duties, Bobby could go from repairing our tractor and mowers, to installing a security system in the mansion and Heritage Center to working on our computers. He saved us many thousands of dollars. Moreover, we learned that Bobby had very good management skills and in 2014 was given the position of Site Administrator. As Site Administrator, he was responsible for all of the office duties – paying bills, tracking income from gifts, memberships etc., and managing our memberships. He was involved in hiring and training new docents, scheduling the docents, and managing our yard workers. Additionally, he was always willing to give tours to visitors who showed up when we were otherwise closed. Bobby was always looking at ways to save money and help Hope make money. He was the driving force behind our first yard sale and flea market, which is now an annual event. And, he and a former docent, Rhonda Forsythe, began our harvest festival which has been very successful. He was very good at finding items online that ranged from office equipment to chairs at much reduced prices. Perhaps most importantly, Bobby had excellent people skills and worked well with the staff and public. He was the face of Hope when someone called or came by to schedule weddings and other events and worked with them to ensure we were prepared for the event. Bobby’s wife Joyce was by his side every time needed and assisted in many events. We all wish Bobby and Joyce well. Caretaker Wanted – Position has been filled. Thank you to everyone who expressed interest in this position. In lieu of salary, a house with 2 bedrooms including a utility allowance. Vacation and sick leave will be provided. Duties include: ensuring the security and safety of the buildings; inspection of the buildings and grounds daily after each event/function; routine maintenance of the buildings; and assistance with the upkeep of the grounds and events as needed. Requirements: Computer skills and adept in using e-mail and text messaging; general knowledge of repair and maintenance of equipment. Ideal for a small family, a retired couple, or individual. Request a complete job description by calling 252-794-3140 or e-mailing tbs402@gmail.com. Qualified candidates will be interviewed during the week of February 4th. Two references with contact information required. DUTIES: Custody, opening and closing and inspection of buildings and grounds. 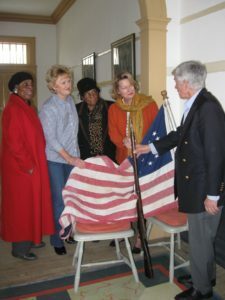 Section A: The protection and safety of the buildings and their contents at Historic Hope Plantation against theft, vandalism, fire and weather elements to such extent possible, is the paramount responsibility of the Caretaker. He/she should take every precaution and security measure available in providing this service of caring for the Hope property. He/she should monitor the security cameras 24/7 or make provisions for someone else to monitor them in his/her absence. He/she should notify other staff members if he/she is going to leave the premises during normal working hours. He/she should check all of the houses and Roanoke Chowan Heritage Center in the morning before opening (10:00 am) and afternoon after closing (4:00 pm), to make sure the doors were/are locked and thermostats have been set at the proper temperature. The Caretaker should stay on the premises every night. Whenever he/she stays away overnight or longer for whatever warranted reason (such as vacation, family illness, etc.) he/she must request authorization for the absence from the President and notify the Bertie County Sherriff’s Office of the days he/she will be absent. The Caretaker should not be absent over 4 nights per month and at least 4 days advance notice should be given for each planned absence. Section B: The Caretaker should inspect the theft security system and all interior and exterior lights including the flood light on the entrance sign weekly and make any necessary repairs. Section C: The Caretaker must be familiar with computers and adept in using e-mail and text messaging. These are important means for keeping in contact with the President and other officers. Section D: The Caretaker must keep the telephone number of Windsor Fire Department, Bertie County Sheriff’s Office and Vidant Bertie County Hospital quickly available at all times. Section E: Each day the Caretaker needs to unlock the public toilets at 9:00 am and lock them after the activities at Hope have ended. He/she is to see that they are cleaned and supplied. He/she is responsible for “winterizing” the public toilets at the appropriate time and closing them for the season. Section A: The Caretaker shall be responsible for policing the grounds, helping mow the lawns, maintain the shrubbery, weed-eating and other duties as necessary. He/she should help maintain the nature trails. He/she is also be responsible for minor repairs to all the buildings (and grounds) on the site. Section B: The President or Event Coordinator will inform the Caretaker as to dates of events that will be taking place at Hope at least one week in advance so that lawn care and proper set-up can be scheduled to coincide with these events. The Caretaker will assist with events as necessary and ensure that the buildings are locked after all events. The Caretaker may need to be present at events in the evening/night. Section C: The Caretaker is in charge of all lawn mowers, tools, hoses, and electrical cords etc., involved in keeping of the grounds. He/shewill keep them in good repair and immediately notify the President when repairs are needed beyond his/her responsibilities. Tools should be properly stored and maintained. Section D: The Caretaker will supervise grounds workers provided by the Title V Employment Program or other workers that may be hired by state or federal agencies or Hope itself. Section A: The Caretaker shall dress in a professional manner during all functions. In most cases a dress shirt, pants and shoes are all that is required. Section B: The Caretaker shall act professionally at all events and should not socialize with guests during the event. The Caretaker will not consume any alcohol before or during the event. As a condition of employment, the Caretaker must reside without rent in the Cox house on the Hope property. B. Hope will pay for the installation and the base rate for a cell phone and internet service. C. Hope will provide electrical service in the average amount of $125 monthly for a yearly amount not to exceed $1,500. Any charges exceeding this annual amount will be the responsibility of the Caretaker. D. Historic Hope Foundation will provide LP gas for heating not to exceed $1,200/year. Any charges exceeding this annual amount will be the responsibility of the Caretaker. E. The Caretaker will have the use of several outbuildings at the Caretaker residence site as long as they are kept in presentable condition. F. The Caretaker will be reimbursed at the prevailing rate allowed by the IRS for use of his/her personal vehicle for Hope business. G. Leave – Sick – 1 day per month. Sick leave credits earned but not used are carried forward into subsequent years of employment to a maximum of 15 days. Vacation – 2 weeks after 6 months in the position. Vacation time earned but not used are carried forward into subsequent years of employment to a maximum of 30 days. Vacation time is taken after consulting with the President and making arrangement for security of the site. The President should be notified when sick leave is taken so that arrangements can be made for security of the site. The Hope Ball was held on April 29th to honor our armed forces on the 100th Anniversary of the US entry into World War I. The decision to resume planning for the celebration was a tough one in the wake of the recent weather damage. The buildings of the Hope Foundation were not flooded, but they did suffer weather erosion. Planning for the Hope biennial ball and major fundraiser was well underway when the flood and then Hurricane Matthew hit. With people still living in shelters, and crop losses in the millions, the entertainment committee agonized over whether to cancel its plans. So the celebration went on. The ball honored the citizens of our region who have served or are active in the armed forces. The three Chairs of the Ball Committee were Major General “Dutch” Remkes of the Air Force, Mrs. Susie Remkes and Dr. John Hill, a military historian and Co-Chair of the Friends of Hope. The Ball included champagne and music in the Hope Mansion, appetizers in the Atrium of the Roanoke Chowan Community Center with music by “Mr.Tunes”, a buffet dinner catered by Southern Delights, and dance music by The Crowd on the covered patio. Horse drawn carriages and vans were provided to move people between the venues. Formal dress was encouraged, especially Military Mess or Service Dress. Thank you to everyone involved and for your continued support of the Historic Hope Foundation. We are pleased to announce that we have four new board members that were elected at the Annual Meeting of Historic Hope Foundation on April 24th. Welcome to Shoshana Serxner-Merchant, Harriet Stout, Dawson Tyler, and Norma Wesson. Dawson Tyler graduated from Washington and Lee University with a degree in history. He lives in Edenton and owns his own business, Down East Preservation, which specializes in the preservation, construction, and design of historical structures. Harriet Stout was Chief Curator of the Chesapeake Beach Railroad Museum for 27 years. She and her husband live in and are restoring the Thomas Bond house, which is believed to be built by Jerimiah Bunch, who is thought to have built the Hope mansion. Shoshana Serxner-Merchant lives in Raleigh and has been a volunteer for our Living History Day program for the past 5 years. She often brings her friends from Raleigh to help with the program. In addition to her time, she is also a frequent donor to Historic Hope Foundation. Norma Wesson is a school and community leader and Branch Manager of Self Help Credit Union in Windsor.